Girard-Perregaux 1966 Full Calendar palladium combines the functions and style of a great watchmaking classic, reworked in a unique metal. 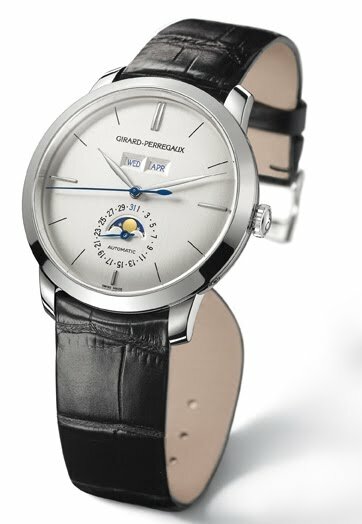 This limited edition integrates a full calendar displaying the date, day of the week, month and moon phases. Time moves fluidly around its perfectly-proportioned dial. Accompanying the path traced by its fine, leaf-shaped hands, two windows placed side-by-side at 12 o’clock display the day of the week and the month. The moon follows its path at 6 o’clock, ornamenting the date indicator. Beautiful symmetry, optimal readability: the Girard-Perregaux 1966 Full Calendar satisfies the most refined tastes in terms of both pure design and distinctive style. On the back, the sapphire case-back reveals the GP033M0 mechanical self-winding movement designed by the Manufacture. With its incomparable whiteness, the palladium case emphasises the outstanding character of these timepieces, available in only 199 numbered pieces. Part of the platinum family, this metal is twenty times less abundant than gold, and more resistant. Palladium is a rare metal much sought after for its numerous qualities. In particular, it does not require any rhodium plating, nor does it tarnish. This makes it the ideal metal for a watch with timeless character, such as the Girard-Perregaux 1966.